Rocks are made of more than one mineral, with no definite chemical composition or crystal structure. Formed when sediments compact together. Deposited in layers and contains sand, pebbles, and frequently fossils. 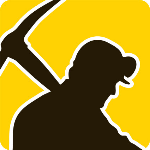 People mine to obtain ores, minerals, and gems.